This is a take on the traditional Tofu Scramble except I didn’t have any tofu so I used up some potatoes we had. 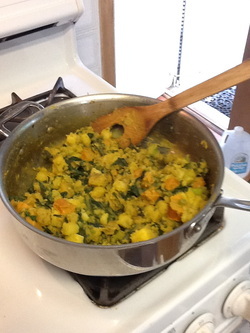 3 -4 Tbsp Tofu Scramble Spice Mix - (Curry, Turmeric, Nutritional Yeast, Cumin is a basic one) I use the one in Dr Barnard’s Reversing Diabetes book there are tons online. Place the potatoes in a large saucepan fill with enough water to cover. boil for about 15 min until just soft. drain the water and put back in the pan to pan cook them with garlic and onions (saute everything if using oil) put the spice mix on them and cook for a few more minutes. If you’re not using oil add more water or broth if the pan as the pan gets dry. When the potatoes are nice and coated add your greens, herbs and any pups if using plus add some more broth or water cover and let cook for 5 minuets or until your veggies are a bright green and your pups are warmed through.